In applications where the echo path does not change very often (as it often is the case of typical applications of Line Echo Cancellers, LEC), there are functional benefits of introducing the second FIR filter, in addition to the FIR adaptive filter (cf. ). Figure 1: Dual FIR filter based echo cancellers can be used to mitigate potential consequences of severe double talk. There is more than one functional reason for introducing the second FIR filter. In this note we emphasize only one particular application of the dual-FIR-filter-based echo canceller (D-FIR-ECAN), namely the reason associated with mitigating possible consequences of severe double talk. The high-level block diagram of the dual-FIR-filter-based echo canceller is depicted in Figure 1: a block diagram of the dual-FIR-filter-based echo canceller. 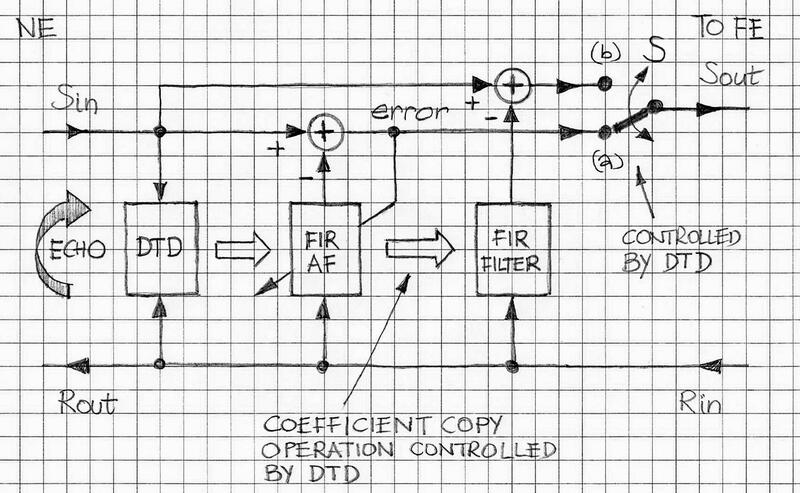 The “coefficient copy” operation and the (a)(b) switch (i.e., the S switch) are controlled by the double talk detector (DTD). The switch operation determines which FIR filter (FIR AF or FIR FILTER) is the main filter (i.e., the one connected to the Sout port of the echo canceller). Note: not all signal lines and control line are shown. (4) The echo path has changed while the mode of single talk (ST) continues. In case (1) the S switch is in (a) position and the FIR AF filter converges, hopefully uninterrupted during adaptation, and the echo return loss enhancement (ERLE) reaches its threshold (case (2)). Then while the case (2) continues, the adaptive filter coefficients are copied to the FIR filter and the S switch is turned to (b) position. Thus the ECAN operates primarily using FIR filter as the main filter that cancels the echo. In the background mode, the FIR AF filter adapts continuously (optionally at the lower rate) and the ERLE is being monitored. In case (3) the FIR filter continues to be the main filter. Estimation of ERLE has ceased and remains inactive as long as the DT continues. In case (4) as soon as the change of the echo path is detected, the switch S is turned back to position (a) and the FIR AF adapts at the default speed. Once the ERLE threshold is about to be attained, case (4) transitions to case (2). To summarize we wish to underscore the benefits coming from the D-FIR-ECAN architecture, such as (a) more reliable operations during the DT condition, (b) better protection from effects of FIR AF divergence during the severe double talk condition and (c) creating an opportunity to reduce the CPU cycles by slowing down the FIR AF adaptation at times when the main filter is the FIR FILTER (and not FIR AF), as indicated in Figure 1. VOCAL’s Line Echo Canceller can be equipped with the second FIR filter (non-adaptive one) if the use cases would support such an application. Contact us to discuss your requirements with our engineering staff.